The first step in using the Bible at home is to get one. Read on to learn about how to select one and to find some of our specific recommendations. Why Have a Bible at Home? And How Will You Use It? The Bible is the top-selling book of all time. Despite what some of us may have seen in our families growing up, the Bible is meant to be used, not just sit on a shelf and collect dust. Sacred scripture is one of the best ways for us and our children to get to know Jesus and God. It can help us direct our lives and pray more effectively. It is not only the story of people thousands of years ago, but it is our story: it helps us understand our relationship with God: how God gifts us, how we are challenged, how we fail, and where our hope comes from. To learn the most important stories, and teach them to our children. To reflect on one or more of the readings we hear at Mass that week (and/or help our children understand it). As a starting point for prayer. To find support or insight around an issue happening in your life. There are a variety of formats in which you can find Scripture published. Study Bibles: These have added features such as introductions to each book, articles, footnotes, maps, and more. If you are purchasing a new Bible for your family, we recommend a study bible. Catholic Bible: There are a small number of books that Catholics consider part of the Bible, but most Protestants do not. Some Bibles exclude these books, so be sure to get one that is Catholic or has the "apocrypha" or "deuterocanonical books." Children's Bibles: Some Bibles are designed for children, with features such as color-coded pages and pictures. Since it is difficult for younger children to understand the language in an adult Bible, it can be helpful to use a story Bible with them. These re-tell stories that are in the Bible in kids' language and with accompanying pictures. Sometimes they add creative details to engage their imagination. We recommend getting a good story Bible to help your children learn the Biblical stories and come to love them as much as others stories they read. Your second priority should be a good story Bible, because it's the best way to teach the stories of the Bible to your child. We've looked at many story Bibles and this one by Ralph Milton is our favorite. We found that our kids (starting in preschool and including early elementary school years) were very engaged with the fun storytelling and pictures. 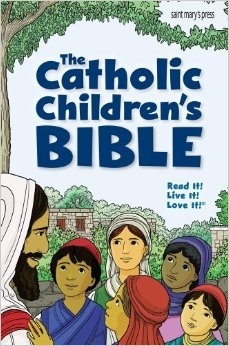 This Bible from St. Mary's Press is a great first full Bible for your child. It has some nice features for kids and uses the Good News Translation, which is a little simpler and easy for kids to understand. Similar to the Catholic Children's Bible, this one is also from St. Mary's Press and also uses the simpler Good News Translation. However, this one is geared toward older kids, with its other many features. If you don't have an adult Bible at all, we recommend starting with a good study Bible. There are many good options, and this one from St. Mary's Press is a great one. It uses the New American translation, so it will match up with what you hear at Mass if you live in the U.S. 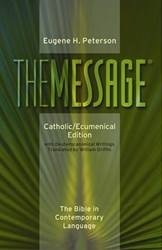 The Message translation is a Bible written for sitting down and reading. It uses contemporary, conversational American English. We like it because it is not only easy and fun to read, but its direct language reminds us that the Bible is talking to us. We wouldn't use this as our only Bible, but we find this one particularly engaging because of the conversational language. This one may be that one that is more engaging for your tween or teen. The books of the Bibles were written thousands of years ago in ancient languages (ancient Hebrew, Aramaic, and Greek). We don't have the original texts, but only copies of copies. There are many different translations of these original texts into English, each taking different approaches. There is a science and an art to translation. Translations fall somewhere on a spectrum between word-for-word and thought-for-thought. Strictly literal translations would sound like a computer translation (not respecting figures of speech or other language differences), while the other extreme can make assumptions that change the intended meaning. Most translations are a compromise between the two approaches. Finally, there are differences between the style of English the translation uses. The original King James Version uses Old English, with "thy"s and "thou"s. Other translations such as The Message use contemporary, conversational American English. Ultimately, the best Bible translation for you is one that you will actually read! Many Bible translations have been officially reviewed by members of the Church hierarchy. Books can receive an imprimatur ("let it be printed") and nihil obstats ("nothing hinders"). These approvals don't mean the Church necessarily agrees with everything in the book, but that they don't contain anything "contrary to faith or morals." There are a number of options for Bibles available online or on your mobile device. BibleGateway.com is a great site with dozens of translations. It is easy to jump to a particular verse or search for key words. The U.S. Bishops make the New American Bible available online. You can find what the daily or Sunday Mass readings are here. BibleGateway has an excellent free mobile app. A comprehensive list of Catholic bible apps can be found here.